On the remote Isle of Harris in Scotland's Outer Hebrides, a man washes up on a deserted beach, hypothermic and completely disoriented. He has no idea who he is or how he got there. The only clue to his condition is a map of the island showing a desolate, ancient path called the Coffin Road. With a sense of dread and no clear idea what lies at the other end, he knows he must follow the trail if he has any hope of discovering his identity. Meanwhile, homicide detective George Gunn makes the rough ocean crossing to a remote, sea-battered lighthouse, despite its isolation, the tiny island has seen its share of tragedy: more than a century earlier, three lighthouse keepers disappeared, never to be seen or heard from again. And now there is a new tragedy, and Gunn must figure out what happened. Coffin Road follows three perilous journeys towards one shocking truth - and the realization that ignorance can kill us. Peter May has written several standalone novels and three series: the award-winning China Thrillers, featuring Beijing detective Li Yan and American forensic pathologist Margaret Campbell; the critically acclaimed Enzo Files, featuring Scottish forensic scientist Enzo Macleod, set in France; and the Lewis Trilogy (The Blackhouse, The Lewis Man, and The Chessman), all three volumes of which are internationally bestselling novels. One of Scotland's most prolific television dramatists, May garnered more than 1,000 credits over a decade and a half spent as scriptwriter and editor on prime-time British television. Before quitting TV to concentrate on writing novels, he was the creator of three major series, two of which were the highest rated in Scotland. May lives and writes in France. 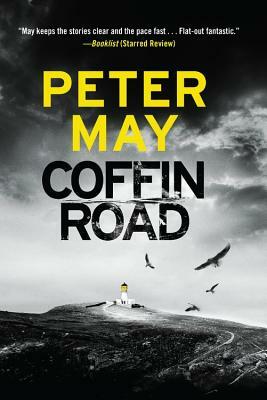 "Like Peter May's other Outer Hebridean mysteries, Coffin Road is a tense, intriguing mystery set against a broody backdrop that lends an otherworldly eeriness to the story at hand." "May keeps the stories clear and the pace fast, with the Hebrides atmosphere serving as a wild, unpredictable fourth character. Flat-out fantastic." "This intense, complex mystery will satisfy especially those who are environmentally conscious, but overall, this is one bang-up read." "Peter May is on a roll . . . [Coffin Road] is a clever, twisty eco-thriller in the mode of Le Carré's The Constant Gardener." "An excellent thriller . . . the pace and good writing swept me onwards." "The bestselling [Peter May] returns to the Outer Hebrides . . . Another cracking story from a writer at the height of his powers." "Peter May is a writer I'd follow to the ends of the earth."